In the early- to mid-2000s, prescription costs were largely held in check with the rise of generic utilization, meaning the number of prescriptions filled in generic form. The current rate of generic utilization is 80 percent or more of the number of prescriptions filled, with the average generic drug price around $28. This average cost has increased lately due to mergers and acquisitions in the pharmaceutical industry, resulting in fewer generic drug manufacturers. In reviewing medical claim data on employer groups, the prescription spending average is now 30 percent of claims or more. There are outliers, with some employers having 70 percent or more of claims going toward prescription costs. The higher percentage costs are often due to specialty pharmacy medications (injectable drugs or biologics). As more specialty pharmacy drugs are coming onto the market with high price tags, we will continue to see premiums rise, along with increased copays or coinsurance for prescriptions, shifting more costs onto consumers. This has been evidenced in the UBA Health Plan Survey results, with increasing blended copay/coinsurance models for prescriptions, along with more plans with a fifth tier for specialty pharmacy. 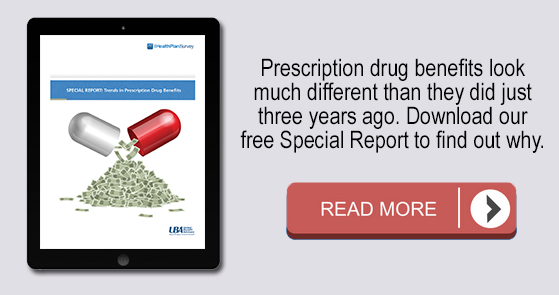 According to the UBA Special Report on prescription drug benefits, 30.2 percent of prescription drug plans use varying combinations of copays and coinsurance, a 14 percent increase from the previous year. 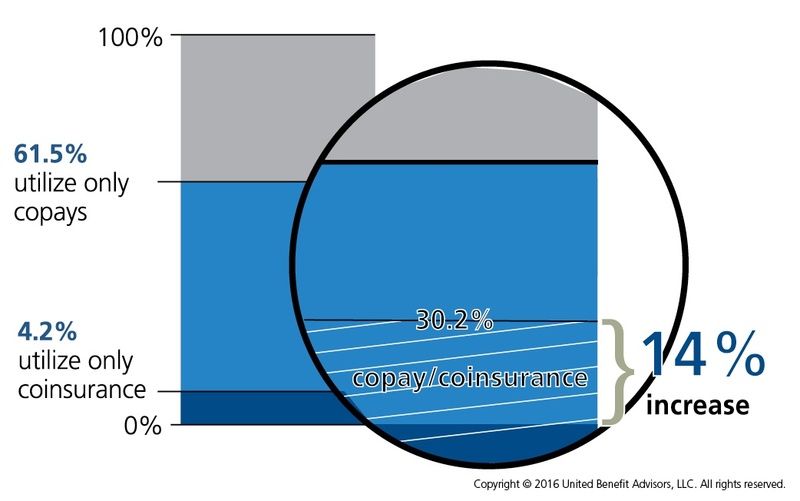 Some plans may use a copay structure in the first two tiers and then employ a coinsurance model for the higher tiers. Other plans contain a percent-based cost-sharing model to accommodate higher priced “specialty” medications (for example, 20 percent with a $100 maximum). This cost containment trend will continue as there are very few new brand name (non-specialty oral) medications coming onto the market, with the pharmacy industry focusing its research and development on the specialty/biologic therapies. The research and development teams are also looking to expand or re-purpose indications, which is where a drug is later tested for use on other illnesses, which are sometimes very different than the original intended use. Several claims administrators have seen specialty pharmacy costs skyrocket in the last two years, jumping from just over 20 percent in 2013 to 35 percent in 2015. One administrator saw an 18 percent rise in total pharmacy claims in one year alone in a particular industry, the bulk of which was attributed to specialty drugs. As an example to help fully understand how these costs affect consumers, one employer with an average of 88 employees enrolled had 47 percent of total claims result solely from prescription costs, with 78 percent of that amount for one drug to treat chronic hepatitis C. Simply put, for this one employer, it cost each enrolled employee more than $114 per month, for a full year, to cover the cost of one drug, for one person. While the cure rate with the medication is extremely high, it has some very serious side effects and patients cannot miss a single dose. The rising prescription drug costs directly impact the premium amounts insurance carriers charge. With some groups’ pharmacy spend increasing by 40 percent or more in one year, there will be no choice but to reduce benefits and increase the employee contribution for coverage. The only other steps that can be taken to rein in the cost of specialty medications is to implement stricter step therapy protocols or exclude certain medications altogether. Step therapy requires that a patient first try high efficacy, lower cost medications before an approval is granted to cover the higher cost specialty medication. There are usually several medications that must first be tried with no or unfavorable results before moving on to other medications. These costs must be controlled, and right now the only way to accomplish this is through savvy medical consumers knowing the true cost of their prescriptions (not just their copay amount) and through strict protocols for approvals to cover the medications. Watch for this trend to continue as well as raising copays and out-of-pocket costs for medications.